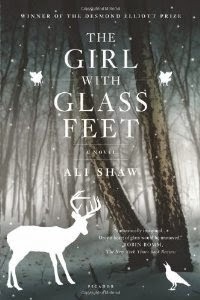 The first thing that I want to say about The Girl with the Glass Feet is that it is beautiful. The story is beautiful, the writing is beautiful; but it is also incredibly melancholy. The entire book (well the first half) feels like it is under a veil, and while all these beautiful things are occurring and all of these beautiful people are living, it is so terribly sad that it feels like there is a rock tied to your heart and you are fighting so hard to be happy and stay uplifted but there is nothing you can do about it because no matter how much you want things to be ok, they never will be and its confusing because it’s still the most beautiful thing that you have ever seen. On her search for the mysterious man Ida stumbles across Midas, a local who lives and sees the world through his camera. Midas is a little socially awkward but he feels drawn to Ida, just as she feels drawn to him. He knows about the man that Ida is looking for, but is not sure that he trusts her enough, or is quite ready to open the wounds that telling her would involve. Midas’ only real connection to the world before this has been his friend George and his daughter Denver. George’s wife, and Denver’s mother, died a few years ago in a tragic accident and Midas does what he can to help them cope, although Midas has his own demons to deal with ‘she nodded. “It’s all a shame Midas, nothing good ever came from my marriage to your father.” And I think that Midas is gaining more from Denver than she is from him. Her advice? “I don’t think there is being brave, anyway. I used to not tread in puddles in case I fell in them and died like Mummy did. But then in the autumn when it flooded I got stuck and had to splash through one. It didn’t feel safer or worser. I just had to splash through it or wait until the sun came up and it all dried out”. Before I started this book I assumed that it was going to be another fairy tale story, even though it’s not actually based on a fairy tale, as far as I am aware of. And it is, a girl is turning into glass and it’s happened before, there are flying dragonflies that are actually cows, and a mysterious creature that turns you albino if you look in its eyes. But, the more I read the more I realize that that’s not really the point of this story. This story is about loss and coping with loss when you don’t want to and you have no idea how to keep living, but you don’t have a choice. My only real complaint about the book is that it seems that Shaw is trying too hard. The language is a little hard to get used to, it is overly descriptive at the beginning although it seems to have toned down, either that or I am just more used to it now. And I am really looking forward to finishing it, but I don’t think that it’s going to be a very happy ending so I am trying to not get my hopes up – beautiful and melancholy don’t very often lend themselves to happy endings. I wanted to choose a melancholy tea with which to accompany this book, but since tea makes me so happy, it was hard to find one. Instead I chose David's Midsummers Night Dream - a tea named for a story that is also beautiful and melancholy.